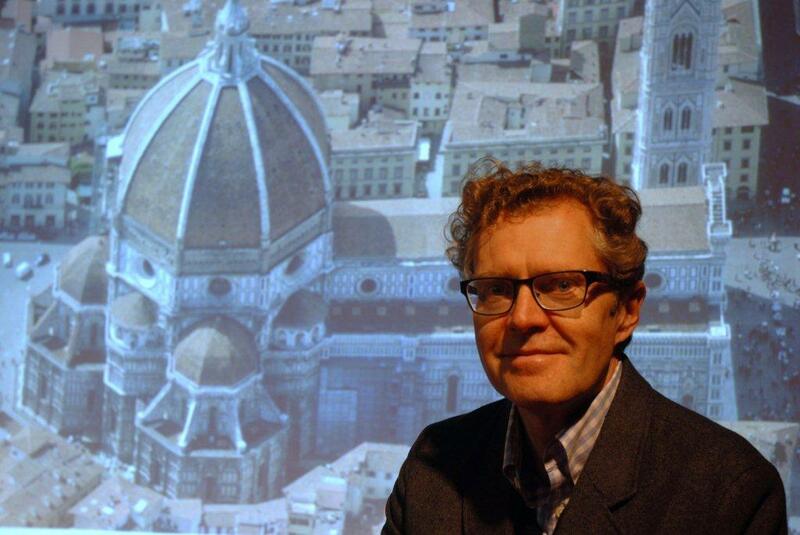 The dome on Florence Cathedral, completed in the mid-15th Century by the volatile genius, Philippo Brunelleschi, is considered one of the masterpieces of the Renaissance and Ross King gave a magisterial talk on May 2nd detailing how the landmark construction was achieved. Brunelleschi is also renowned for his development of linear perspective, as well as many other accomplishments, including sculpture, mathematics, engineering and even ship design. However, Ross told us little is known about Brunelleschi's early life to explain his remarkable transition from goldsmith to architect - and, no less importantly, the evolution from his training in the gothic or medieval style to the new classicism in architecture and urbanism within the Renaissance, with his work winning admiration from both Leonardo and Michelangelo. Work on the basilica of Santa Maria del Fiore in Florence had been in progress for many years when – in 1418 – the nature of the dome still had to be agreed. Much of the cathedral was designed in the previous century and the powers behind the project still had no idea how the self-supporting dome would be built – given that it was going to be even larger than the dome of the Pantheon in Rome and nothing on that scale had been attempted since those times. 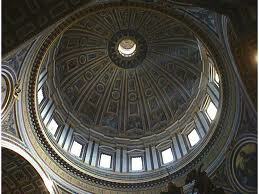 It also had to compete with the scale and grandeur of the cathedrals in the rival cities of both Pisa and Siena. One of the stumbling blocks, Ross told us, was that the city grandees had forbidden buttresses, which were considered part of the north European tradition. More importantly, it was not practical to construct rafters long enough – and in sufficient numbers – for the task. And so it was impossible to conceive of how a dome of that size could be built without it collapsing under its own weight. In addition, Ross said, the stresses from the physics of compression were not fully understood at that time and, importantly, the mortars used would only set hard after several days, putting the scaffolding under extreme pressure. As a result, the Opera de Duomo, which oversaw the project, held a competition to see who could solve the problem of erecting the dome on top of the cathedral. They received several entries with creative ideas, ranging from filling the centre of the cathedral with dirt and building the dome on top of that - to placing supports within the cathedral. At one point, the competition consisted of rival architects attempting to stand an egg upright on a piece of marble. None could do it – apart from Brunelleschi, who, according to the historian, Giorgio Vasari, gave one end a blow on the flat piece of marble and made it stand upright. Brunelleschi's design contained two shells for the dome - an inner shell made of a lightweight material, and an outer one of heavier wind-resistant materials. In creating two domes, Brunelleschi solved the problem of the weight during construction because workers could sit on top of the inner shell to build the dome’s outer shell. In order to support the dome, Brunelleschi devised an ingenius ring-and-rib support from oak timbers. Although this type of structure is common in modern engineering, Ross told us his understanding of the forces needed to sustain the dome was revolutionary. The rings hug both shells of the dome, and the supports run through them. Other than a few modifications to remove rotten wood, these supports still hold up the entire dome. Another concern at the time was how to get the bricks, making up the dome, to stay up and not fall to the ground during construction. Once again, Ross added, Brunelleschi had an incisive idea that is common practice today, but revolutionary in its time – creating a herringbone pattern with the bricks that redirected their weight outwards towards the dome's supports, rather than downwards towards the floor. Through observing carefully the curve of the dome as it took shape, Brunelleschi was able to place these bricks in key areas. The dome, the lantern (built 1446–1461) and the exedra (built 1439-1445) would occupy most of Brunelleschi’s life and his success could be undoubtedly attributed to his technical and mathematical genius. He used more than four million bricks in the construction of the dome (possibly inspecting each batch personally) and even invented a new hoisting machine for raising the masonry needed for the dome – a technique possibly inspired by the re-publication of Viturvious’s De Architectura, which describes the Roman machines used in the first century AD to build large structures such as the Pantheon and the Baths of Diocletian – structures which he would have seen for himself. Another practical measure during construction, said Ross, was that Brunelleschi kept his workers up in the building during their breaks and brought food and wine up to them. He felt the trip up and down the hundreds of stairs would exhaust them and reduce their productivity. In a further attempt to motivate the workers, he gave them diluted wine, similar to that given to pregnant women at the time. At nearly 142 feet wide, the dome is bigger than St. Paul’s Cathedral, in London, and even St. Peter's Basilica in Vatican City. 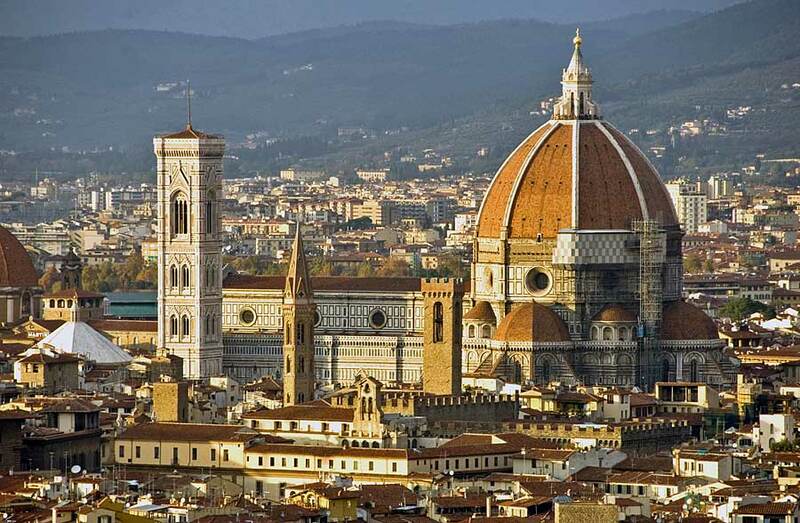 Ross told us that, if Brunelleschi were to visit his dome today, he would see that little has changed in nearly 600 years, with the dome surviving hurricane-strength winds, and several earthquakes. In the early 1900s several of the oak supports inside the dome had to be replaced – but, even today, visitors can take the same route as the builders when climbing to the top of the dome.